We are proud to contribute to the 2017 California Educational Research Association (CERA) Annual Conference. This year’s conference theme is “Improving Education through Partnership: Sharing Ideas, Connecting Systems, and Creating Solutions.” Our co-presentation discusses our solution to helping manage the logistics and scoring of performance tasks. 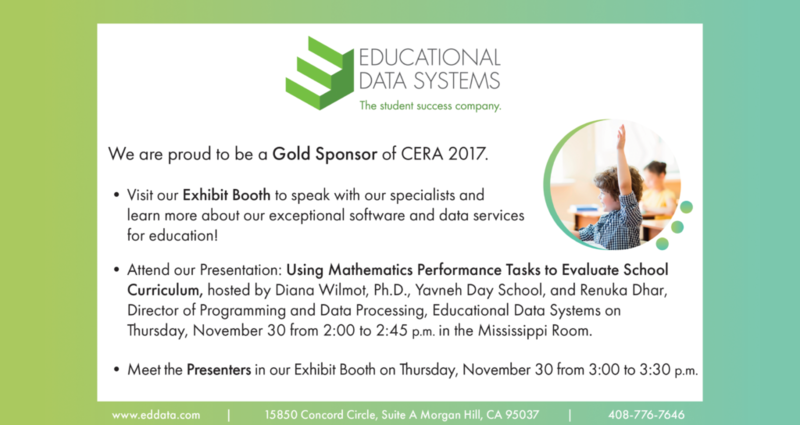 Educational Data Systems is participating in a number of other ways too: We are a conference Gold Sponsor; we are the Conference-at-a-Glance sponsor; and we are hosting an exhibit booth. Stop by to speak with our specialists. The conference runs from November 29 to December 1 at the Disneyland Hotel in Anaheim, CA.